TECHNICAL ASSISTANCE (TA) / MENR TEAM VISIT TO COMPONENT 4 PROJECT SITES AND REGIONAL OFFICES. The WaTER Programme is implemented as 4 different Components. Delivery of Component one of the programme is coordinated by the Ministry of Environment and Natural Resources (MENR). The Ministry has brought on board a Technical Assistance (TA) team to support delivery of the whole programme. In light of these developments, the Ministry requested Components 4 Project team to introduce the joint TA/Ministry team to the Component 4 teams and their project implementation sites in Cherengany Hills and Mt. Elgon Eco-system. The Component Management Office (CMO) together with the KEFRI regional offices in Lake Victoria Eco - Region Research Programme (LVBERP) Maseno and the Rift Valley Eco-Region Research Programme (RVERP) Londiani organised an elaborate Programme and introduced the TA team to their staff and regional Project sites. 1. Model demonstration sites for forest rehabilitation in Maragoli Hills established by KEFRI, Tiriki gardens bamboo enterprise, Germplasm demonstration site in Kaimosi, bamboo demo plot in Butula (Busia County) and woodlot demonstration site in Kapsokwony (Bungoma County). The team appreciated the good work carried out by KEFRI and the communities in all the sites visited under the Mt. Elgon Eco-region Programme. Due to time constraints the team was not able to visit as many sites and nurseries as desired. 2. The TA team also visited selected sites under the Cherengany Hills Eco-region all the way to West Pokot in Kapchilla where Component 4 have established a green house and riverine protection using bamboo in Kariwo’s farm. 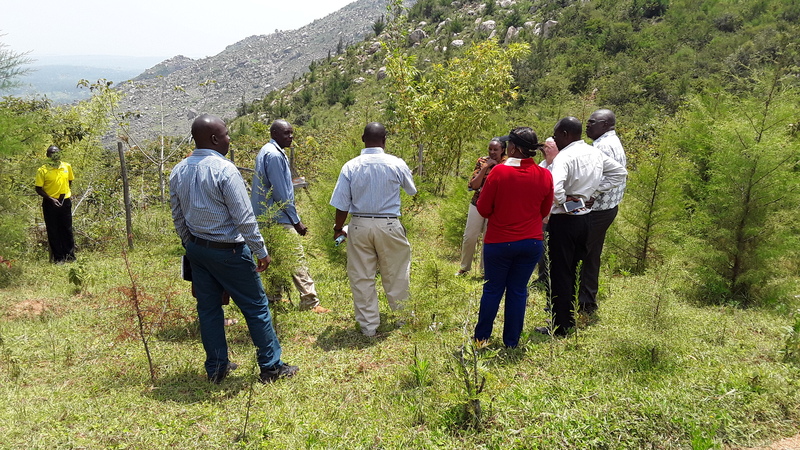 In Kapcherop Project sites, the project demonstrates assisted restoration Technology in Kiptaberr as well as on farm demonstration planting of Ecalyptus and Cypress woodlots both in Kapcherop. The TA and MENR team were appreciative of the work carried out so far by the KEFRI regional teams. The TA team appreciated the work done by KEFRI together with communities and other stakeholders towards conserving the Water Towers. They indicated that the outcome from the WaTER programme will inform similar interventions in the other water towers.